Using something called “Primeknit”, Adidas has created a running shoe that expands with the foot’s every move resulting in a uniquely comfortable fit with less irritation felt by the feet. The elastic rubber soles are light in weight and texture allowing for energy boosts from landing to takeoff of each foot. The rubber outsoles provide sufficient traction in both wet and dry weather. Runners can head for the trails wearing the perfect light-weight running shoe providing traction and comfort over most hiking trails. These shoes have a mid-foot wrap that steadies each stride and have been treated for odor resistance. The “Vibram” outsoles bend where necessary because of the contracting power of the cleverly-placed flex in the soles of the shoe. These running shoes are designed to supply men with bursts of energy while propelling their every step with forward-moving strides while sustaining the impact of each foot strike. This shoe, which feels similar to a sock stretched over the foot offers flexibility, has a boost midsole construction with an upper part made of an elastic mesh material that adds to the personalization of each wearer. These running shoes are made of mesh using panels that stretch anatomically over all the bones in the foot. It responds to the supportive midsole cushioning providing protection, comfort, and energy boosts with each step. The Brooks Cascadia forefoot running shoe has been reported as being capable of withstanding roads full of dirt, tree branches, rocks and construction debris which make them reliable for fitness walking practically anywhere. The upper part of the shoe is made of lightweight microfiber with a breathable lining that absorbs moisture and keeps the feet dry. This running shoe provides heightened pliability and durability protecting the wearer over varied landscapes and the wearer will experience secure traction in wet or dry weather. a heel strike which is landing on the heels of the feet, moving into a flat position, then onto the balls of the feet. Thus, forefoot running is a method of running which focuses the landing on the forefoot or midfoot strikes. It has been associated with running barefoot which, according to those who’ve actually run barefoot, is a comfortable way of running that contributes to healthier feet. Although findings are not conclusive regarding whether it’s best to run using forefoot, midfoot or heel strikes, there’s enough evidence to present certain advantages and disadvantages of each. In the article from Barefootrunning.fas.harvard.edu” (a website developed by four Harvard University graduates), clear explanations are given on the advantages and disadvantages of forefoot running. Overtime it was discovered that heel strikers experienced significant impact injuries. It was considered that a better way for the foot to land might be on the ball of the foot first (called a “forefoot strike”) for easier enablement of keeping the foot parallel to the ground until the heel is finally lowered in a controlled manner. Also, heel strikes tend to force the runner to a full stop, whereas landing on the ball of the foot keeps the foot and the runner moving in a forward motion. Then a more lightweight shoe was considered since wearing thicker, heavier shoes can cause the lower legs to over-exert themselves when trying to support the weight of the heavier shoe. Incidentally, it was also determined that the runner should make sure to land on the ball of the foot and not the toes as landing on the toes could prove to be just as harmful as landing on the heels. In an article by ”Berkely University of California”, a comprehensive assessment of forefoot running verses standard fitness running is given. They also advise that taking up barefoot running, or something that resembles this by using a particular choice of forefoot running shoes, should be eased into gradually as it might not be for everyone. Running barefoot on a hard surface is not easy and neither is it very comfortable, especially for those who’ve become used to wearing footwear that protects the wearer with sufficient amounts of heel cushioning and arch support. Also, if users want to change to forefoot running, then they must give the body a chance to adjust to the transition by gradually easing into this new venture. Therefore, instead of immediately purchasing forefoot running shoes, it’s possible they may find that staying with their own fitness routines and keeping the standard footwear they’ve always used are the best choice for them. Once it’s decided that forefoot walking and running for fitness purposes is what is wanted, shoes with flexible, light-weight support will be required. Heavier footwear which offers stability for general walking and heavy cushioning for comfort can be too stiff and bulky for those participating in forefoot running activities. The type of construction in forefoot running shoes provides impact protection which prevents the injuries that can occur with other types of athletic shoes. They have extremely thin midsoles and outsoles and the tops of these running shoes are also made with light-weight materials (mesh or knitted materials). There’s no cushioning on the heels as forefoot running shoes are designed for runners who land on the balls of the feet and not the heels. Forefoot running shoes have a natural feel that moves with the foot instead of limiting the movement of the foot. As intended, they offer the kind of flexibility which feels very similar to running with bare feet. Forefoot running shoes are built to mirror the human feet as closely as possible with the intent being to lessen the chance of pain and injury for runners. It’s a flat shoe where the toe and heel areas are level with each other. It’s described as being “minimalist” footwear as its construction is light weight all-around with no cushioning in the heel area, yet properly cushioned where it needs to be (see ”Run Forefoot” for an extensive description). There’s no conclusive evidence about which running style works best because if the runner isn’t running properly, any running style will cause injuries to the body. Therefore, there’s a job that each runner will have to do which is learn what works best for them. However, should it be decided that forefoot running is the chosen style, this article is designed to present information, basic instructions, and make it easier to decide on the best forefoot running shoe to purchase. MileSplit: Heels Or Toes: What Is The Best Way To Run? 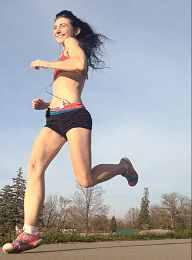 Running Physio: Should I switch to forefoot running?